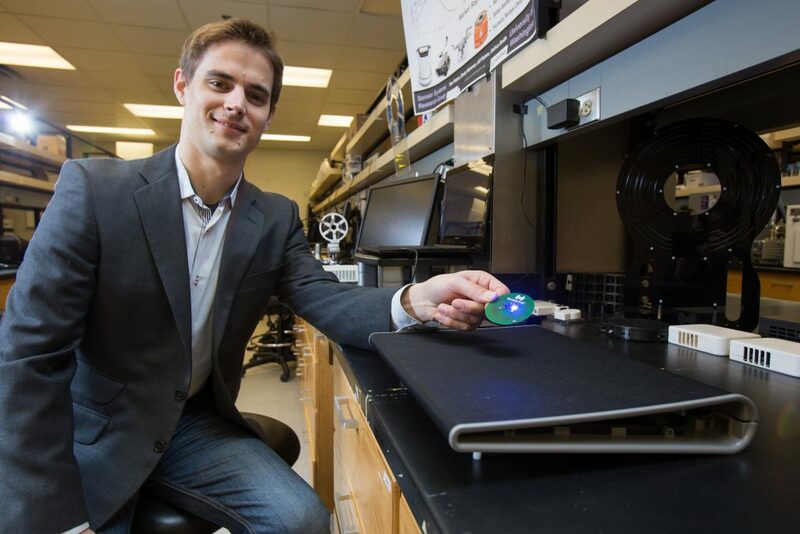 ECE alum Ben Waters (Ph.D. ’15) cofounded WiBotic, which is changing the future of how robots recharge. Traditional methods for recharging robots are cumbersome and require extra battery packs, plugging-in or docking at specific locations. For autonomous robots especially, which are designed to care for themselves, they must be able to easily manage their power supply in order to become truly useful. Enabling robots to more effortlessly recharge, ECE (formerly EE) alumnus Ben Waters (Ph.D. ’15) and Associate Professor Joshua Smith founded a start-up, called WiBotic, which is changing the future of how robots recharge. Introducing a wireless charging system, WiBotic simply requires robots to be in close proximity to a charging station to charge their battery. The system consists of a transmitter and transmit coil mounted on the wall or floor and a small receiver mounted inside the robot that connects to the existing battery. The WiBotic system automatically detects the robot and turns on, continuing to charge until either the battery is full or the robot is alerted to another task. WiBotic’s first product is a fully customizable, off-the-shelf kit suitable for testing and integrating wireless power into existing robotic applications. An early-stage startup company, WiBotic’s first product is a fully customizable, off-the-shelf kit suitable for testing and integrating wireless power into existing robotic applications. While there are other wireless power companies on the market, WiBotic is the first to focus specifically on robots, specializing in three types of systems: mobile, underwater and aerial robots. In six months following incorporation, WiBotic has acquired a diverse customer base from academia to private corporations. The idea for WiBotic surfaced while Waters was researching how to power implanted medical devices. 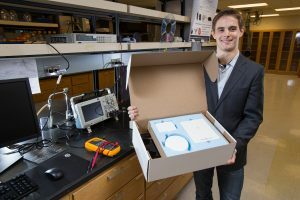 Visiting researchers working on robotics in the Sensor Systems Lab expressed interest in wireless power, which led Waters to shift his focus to powering robots. The system he developed for powering medical device implants was so robust that the transition was seamless. Once the co-founders decided to commercialize the research, things progressed quickly, thanks to the innovation culture at UW ECE. Working closely with CoMotion, UW’s commercialization center, the WiBotic team received mentorship from entrepreneurial professors, assistance filing patents and access to funding and external advisors. UW’s Center for Sensorimotor Neural Engineering also provided funding and commercialization assistance. The WiBotic cofounders are committed to giving back to the UW innovation culture. At the inaugural UW Innovation Summit in Shanghai in November 2015, Waters was invited to give a presentation about WiBotic, with the hope of inspiring future entrepreneurs.